Read and comment on this story from the New York Post on a new tv series coming to Fox that includes a Returned Peace Corps Volunteer as one of the main characters. 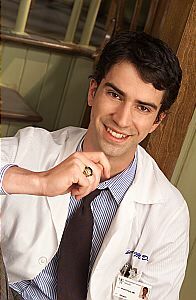 The part is played by Hamish Linklater (shown in the photo above) best known for his role as Dr. Bruce Cherry on Gideon's Crossing. James Cann will play the RPCV's conservative stepfather in a plot evocative of "All in the Family." Anybody have any suggestions on what a tv show about a Returned Volunteer should be called - post it below. April 13, 2002 -- JAMES Caan is going from "The Godfather" to the stepfather - with a smile on his face. The tough-guy actor, who played mobster Sonny Corleone in the classic Mafia movie, has inked a deal with Fox to star in a sitcom pilot, according to a report in Variety. Caan, 62, (shown in the photo above) will play a conservative stepfather clashing with his liberal stepson - who's just returned from a stint in the Peace Corps (shades of the CBS classic "All in the Family"). The show marks Caan's first entry into series television. Hamish Linklater ("Gideon's Crossing") is scheduled to play the stepson, with Mary Birdsong - from Comedy Central's "Daily Show" - playing his sister. Caan's wife in the series has yet to be cast, according to Variety. Besides "The Godfather," Caan's movie roles have included a stranded fiction writer menaced by Kathy Bates in "Misery," the memorable ABC TV movie "Brian's Song," "Mickey Blue Eyes," "Honeymoon in Vegas" and "Alien Nation." Caan's next big-screen role is in "Dogville," starring Nicole Kidman. If Hamish Linklater plays a dufus Alan Colmes as a foil to Caan's rendition of sociopath Sean Hannity, thank you, I'm not interested. It will just be another Rupert Murdoch low-class offering, shamefully misusing high-class actors for Murdoch's slimey purposes. Give me Ally Mcbeal. At least there is no so-called "RPCV character" to act dumb and degrade the Peace Corps ideals. Why don't they call it "Rupert vs the Peace Corps" (a la "Joe vs the Volcano")? That will guarantee a minimal audience. I love ..."Lost in the Supermarket"
WHO IS REALLY TAKING THIS SERIOUSLY? A HOLLYWOOD SITCOM? SINCE WHEN WERE PCV'S PARTICULARLY LIBERAL? I CAN'T SEE AN 'ALL IN THE FAMILY' TYPE SHOW, GOD FORBID. I DON'T THINK MOST AMERICANS HAVE A CLUE ABOUT THE PEACE CORPS, OR THE REST OF THE WORLD. THE SHOW WOULD HAVE TO HAVE A MULTI-NATIONAL CAST, FOR STARTERS, FOR ME TO TAKE IT SERIOUSLY! EVERYTHING ON TV IS STEREOTYPED, AND I'M AFRAID THE PC WOULD BE STEREOTYPED, ALSO. Comes to my mind, if the sitcom writers were former PCV'S the show could be enlightening, instead of the usual pablem on the tube. Another Piece of Crap from Fox! I suggest the title for the new FOX TV show to be "The Corpsman". How about, "Not all RPCV's are white"
"The Longest Vacation You'll Ever Hate"
I love the Peace Corpse - everyone calls it that anyhow! For all you crybabies out there, SHUT UP! Give Peace a Chance, Jeez! I did my service from 1978-1980, inclusive, and it changed MY life. Three years of some of the most challenging situations and events that I truely relish, even to this day, 25 years later. Directionless, headed for rehab, I became a teacher back here and have loved it. Straightened me completely out. If Fox wants to explore possibilities(which is just exactly what you wanted to do when you chose the Corps), at least give them a chance. I, too, am skeptical, but I urge all of you to consider the positive potentials. How long did it take TV-Land to create and produce a credible rendition of "Lord of the Rings"? Stop and consider. If it turns putrid, we all can justifiably complain, and redisplay "Power to the People" They will take it off the air. But don't condemn what you don't know. That's just, plain STUPID. Hopefully you really did learn something during your two years of grace, other than how to be irritatingly parochial. How about "Bringin' It All Back Home" - that used to be a slogan of the National Council of RPCV's. Works for me. "Now I have to pay for travel"
"Two Years on the Government"
"How I Spent Your Tax Dollars"
I have to work to get paid? damn, we are a rich country! What about "Where's my Distiller?" The toughest job you'll ever love equals The longest Vacation I've ever taken!!!!! "The Strangest People You'll ever meet"
"Out from under the Mosquito Net"
"It takes a Village, . . . and a Volunteer, . . . "
"Back in the 1st World"
"No more Deferred Student Loans"
"Can I Drink the water?" "Return to the Real World"
"Relative Strangers" hits the readjustment nail on the head. If portrayed accurately, this would be an excellent recurring theme. "Post Corps" is very good also. Too many brands of toothpaste, the horror, the horror. Sleeping in a Bed again, or My adventures with backpain. I think the actors of the show as well as the writers should visit a few PCV posts around the world, like say for example, a no running-water, only onions, tomatoes and garlic at the twice a week market in your village - type - post. I would hate to see this be a mockery! I like "Return to Anonymity"
I can't see this being anything but a mockery and a farce. There are, however, hundreds of thousands of folk who wouldn't even notice. I'd hate it, but any PR is good PR (thank you Mark Cuban). Likely it would only demean Peace Corps, but it wouldn't hurt recruiting. Hey Brother Can You Spare A Job?